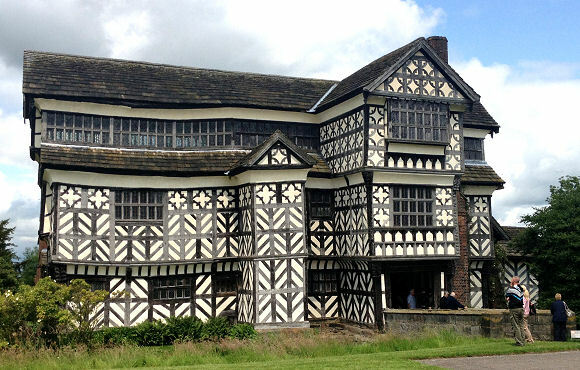 If a child, or indeed anybody at all really, thought of what an Elizabethan house should look like then this is it. Even the National Trust use the term iconic and they are not given to hyperbole. Logically it shouldn’t still be standing up, or even standing at all. Engineers in 1990 looked at it for a restoration programme and said it defied all the normal rules. Inside you’ll see a wooden replica of the house which looks like one of those matchstick models people with plenty of time on their hands make, such as Big Ben or Buckingham Palace. It’s quite obvious the frame is made of wood. The house has a a sturdy heart of oak which has buckled and bent over the centuries into impossible angles. Although there is no bar inside a walk around, especially on the upper floors makes you feel as if you have been in the bar all afternoon. The original parts of the house were built by William Moreton around 1504 and he built to impress the locals. Additions were added by his descendants until about 1610. The estate ran to over a thousand acres and there would have been orchards as well as farm land. Records have not survived about how the original gardens within the moated area were laid out but it is likely that there was some kind of knot garden or parterre with two viewing mounds so that visitors could see the intricate designs. One of them still survives today. 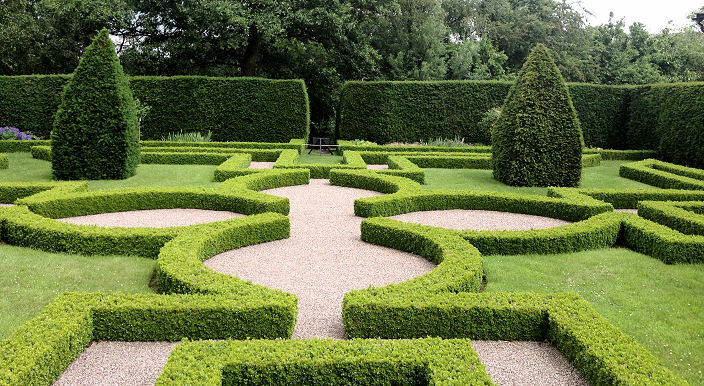 During the buildings passed into to the hands of the National Trust in 1938 but it was not until the 1980’s that they decided to recreate the formal garden to a sixteenth century Tudor quatrefoil design. 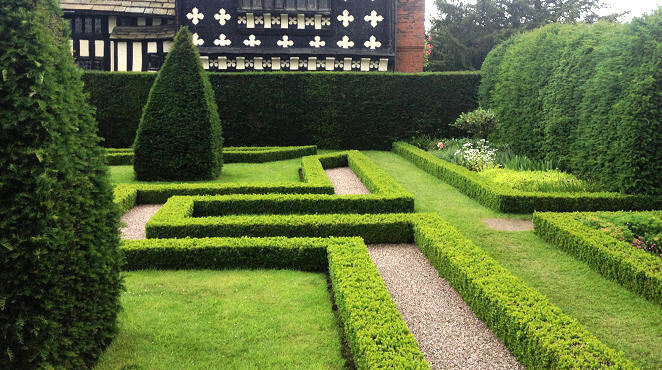 The guidebook calls it a knot garden as that was the original fashion but strictly speaking its is not a Knot, as in that design the various hedges give the appearance of interweaving with each other by having different heights as a piece of string would. Emphasis is often given to this by using different types of colours of plants. So for the purists this is an open parterre as it is infilled with gravel or grass (A closed parterre has soil and plants growing inside and is called closed as it puts a formal frame around a garden segment). Mind you what a parterre it is. 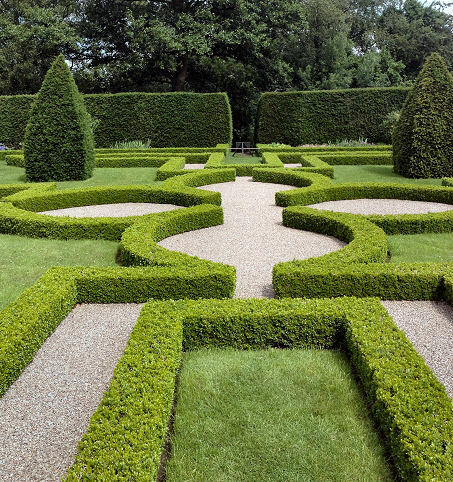 It takes one gardener 80 hours per year to cut the box hedging alone. hedges to enable people to walk beneath it. Parterres were often used for gentle strolls in dry periods often to think of the glory of God and his interconnected design for the universe. Amen to that.